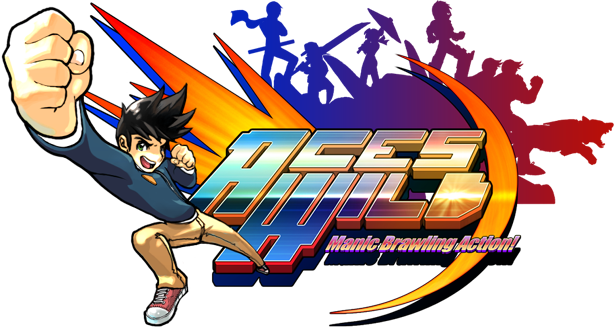 The Holynub Report: Completionist 2014: Aces Wild: Manic Brawling Action! Completionist 2014: Aces Wild: Manic Brawling Action! Picked this one up as part of the Humble Coop Bundle. It looked fairly interesting and I liked the cartoony anime style it had. It is a floaty crazy mid-air combo side scrolling beat-em-up. Huh... Did I really string those words together? Mehhhhh that sounds about right. I had a lot of fun, it was very easy to get into but near the end the game seriously ramps up the difficulty. Its a ton of fun comboing and getting groups of enemies caught up in your combos. I only had a few qualms about the game though. The coop mode of this game is local coop only. I can understand that though, as later on you'll need almost frame by frame like precision for dodging enemy attacks. The character selection is limited, there's only 3 playable characters. The main character, Ace, is the only one with a unique sprite. One of them is a ninja that looks identical to the hundreds of other ninjas that'll come and attack you. So that character tends to get lost in the hoards of enemies. The last character is an identical sprite as the 6th stage boss. This guy uses a sword and is much slower and doesn't dodge nearly as well as Ace or the ninja guy. My biggest gripe would have to be the 6th stage. It has a series of cheap deaths and the final boss of that stage has a difficulty that seems out of place with the rest of the game. It was constant guerrilla hit and run in a combo action brawler. It took me nearly most of my playtime to beat just that one boss. The rest of the game, I kinda blew past and had a lot of fun. But that 6th stage is in my book as the biggest frustration of the game.